Dearest Conferers, The Rogationist Indian quasi Province expresses our gratitude to the Lord for his continuous blessings through the entrance to the novitiate of 9 postulants, the first profession of two novices, renewal of vows of 31 brothers and perpetual profession of two brothers. All these celebrations will take place on May 21, 2014, at Good Shephered Church, Cheriyamkolly. 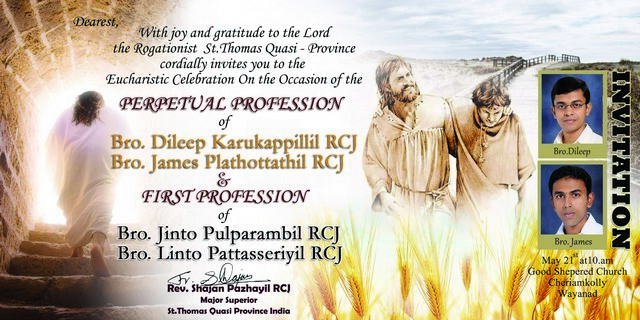 Bros. James and Dileep, after perpetual profession will receive the order of diaconate on June 01, 2014 at Rogate Ashram. His excellency Rt. Rev. Dr. Thomas Chakkiath, bishop Emeritus will be the ordaining prelate.